Bite-sized butternut and sweet potato cubes flavoured with cinnamon, garlic, rosemary and salt and oven-baked in coconut oil. 2. Peel and cube the butternut (+ 2cm2 size). 3. 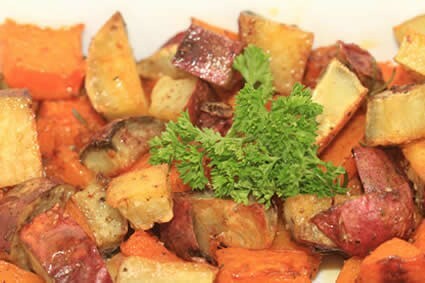 Wash the sweet potatoes and cut into small cubes (+ 2cm2 size). 4. Lightly grease a large oven roasting tray. 6. Sprinkle the cinnamon, garlic and herb seasoning and fresh rosemary. 7. Bake for 1 to 1 and a half hours until the sweet potato and butternut cubes are soft inside and slightly crispy on the outside.